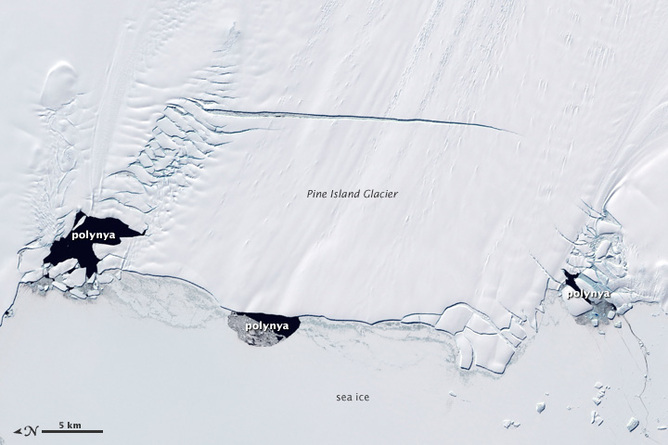 Why Is Antarctic Sea Ice Getting Thicker? For several years now climatologists have puzzled over an apparent conundrum: why is Antarctic sea ice continuing to expand, albeit at the relatively slow rate of about one to two percent per decade, while Arctic sea ice has been declining rapidly (by some 13% per decade in late summer)? Just a few weeks ago the Antarctic saw a third consecutive record year of sea ice coverage. The two previous records were set in 2012 and 2013. 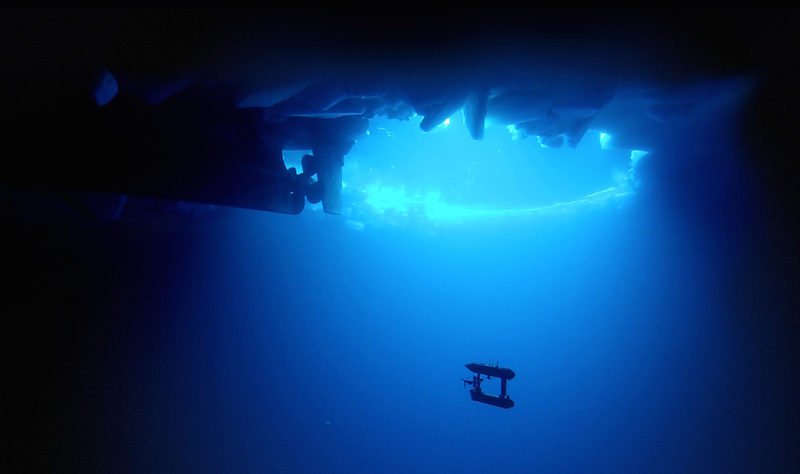 To help get to the bottom of this mystery, one team of scientists have enlisted an underwater robot to help measure the thickness of the ice. Their vehicle, known as SeaBED, has an upwards looking sonar which maps the underside of ice floes and provides novel, highly-detailed three-dimensional maps of Antarctic sea ice. The researchers present their findings in the journal Nature Geoscience. Measuring a total of ten ice floes covering more than 500,000 square meters, they found mean ice thicknesses of 1.4 to 5.5 meters. In some places the ice was up to 16 meters thick. This is much thicker than has been gaged by previous more limited field-based (mainly ship-based) measurements, possibly because ships tend to avoid the areas of thicker sea ice, so there may very well be a sampling selection bias. Satellites would ideally be able to assess ice thickness over a much wider area. However, although they have had some success in the Arctic, at the other end of the world satellites are severely hampered by our poor knowledge of how much snow there is on top of any given area of Antarctic sea ice. The researchers report that the ice they measured was in its first year of growth. This is important because it is the multi-year sea ice (ice that survives more than one summer melt season) which is more susceptible to thickness growth through deformation and ridging. Previous estimates of mean thickness for first-year Antarctic sea-ice – which date back to at least 1986 – suggest it is no more than around a meter thick on average. It has long been recognized however that much thicker multi-year ice floes exist – especially near the coast and the Antarctic Peninsula, where sea-ice ridges can be the size of a house. Although the new study is important, especially from an innovation/technological point of view, I would like to see this kind of analysis repeated across a range of different areas, and if possible seasons and years. At the end of winter around 20 million square kilometers of sea around the Antarctic is covered by ice – an area larger than Russia. The surveyed zone is tiny in comparison. If the results are confirmed by future work, they suggest Antarctic sea-ice may be more resilient towards climate warming than has previously been appreciated. Also, changes in the sea ice will in turn affect land-based glacial ice and free-floating ice-shelves if the sea-ice suddenly gets removed (or is thicker than realized). This is especially important in regions next to the strongly warming Antarctic Peninsula where some ice shelves have dramatically broken away into the ocean. However, it will be some time yet before we know answers to the crucial question of what has caused recent sea-ice growth in Antarctica: is it changes in ocean currents, maybe related to an increase in fresher, colder sub-surface meltwaters running off from the great continental ice sheets? Nevertheless thicker Antarctic sea-ice cover has profound implications. Ice thickness closely controls the exchange of energy between the ocean beneath and the air above – without ice cover, too much heat will leave the oceans and join the atmosphere. Although ice is a very effective insulator, as soon as it reaches a few tens of centimeters thickness, equally important are holes in the ice cover. These holes, knows as leads and polynyas (leads are long rectilinear channels in the ice, while “polynya” comes from the Russian from “open” and is a larger, lake-like opening) act as natural vents or chimneys, releasing hundreds of watts of heat per square meter into the overlying atmosphere. Any changes in the distribution of ice thickness can dramatically affect the points where these features form and their persistence. Thus it is fair to say that Antarctic sea ice thickness plays a pivotal role in what we call sea ice-climate feedbacks, where levels of ice cover are strongly linked to ongoing global climate change and vice versa. It is therefore crucial for scientists modeling sea ice behavior to have a good knowledge of thickness distribution to feed their models. This study represents a significant step forward. Edward Hanna, Professor of Climate Change at University of Sheffield, does not work for, consult to, own shares in or receive funding from any company or organization that would benefit from this article, and has no relevant affiliations.